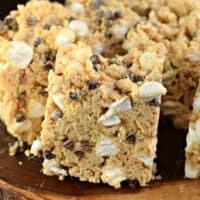 So, as many of you already know, rice krispie treats are one of my all time favorite desserts. 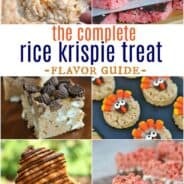 I’ve even come up with a whole set of tips for how to make rice krispie treats at home. The first time I tried Rocky Mountain Chocolate Factory’s Avalanche Bark, I fell in love. I tried to replicate this recipe immediately, and I am proud to say this is pretty darn close to the real thing. Of course they use a much better white chocolate, I’m sure of it! Enjoy the recipe…time to go get on the treadmill for me! Creamy and soft, this 3 ingredient easy Tiger Butter Fudge recipe is a chocolate peanut butter lover’s dream! Make a batch today in just minutes! My worlds have collided. 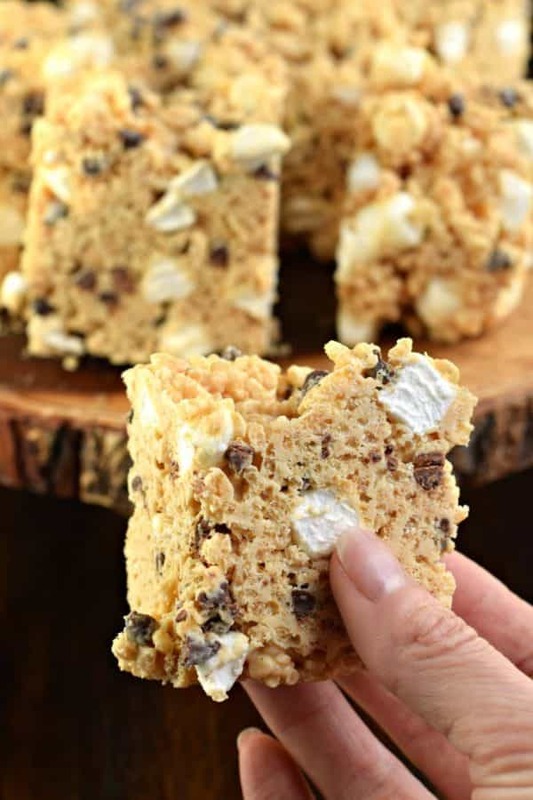 This Krispie Treat Fudge is the best of both fudge and gooey marshmallow treats! 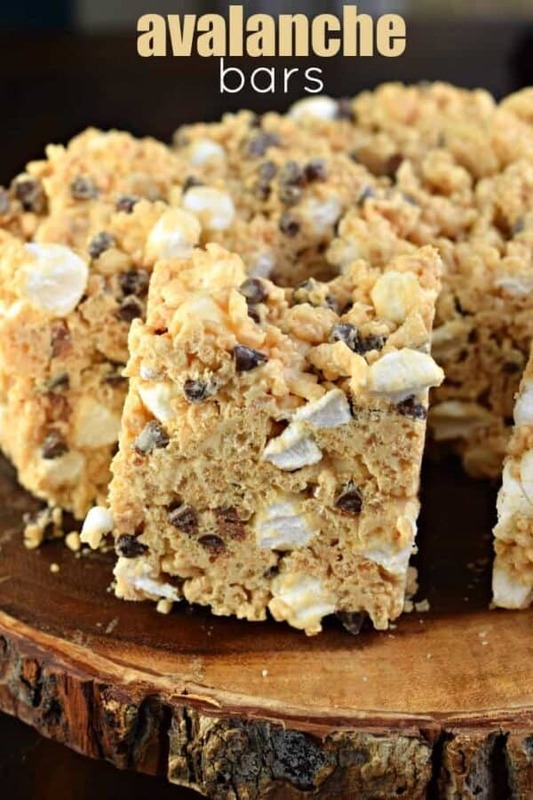 Melt white chocolate chips and peanut butter together until creamy. Fold in rice krispies. Allow to cool to room temperature (about 10 minutes). Stir in mini morsels and mini marshmallows. Pour into a buttered 8x8-inch baking dish, pressing lightly. Refrigerate for 30 minutes, cut into squares and serve cold. Enjoy! You know I’m overweight. Why do you keep doing this? It’s like watching the food channel at 10:30 PM and I have to go out and make a hamburger. Chocolate, peanut butter and marshmallows? Yum! 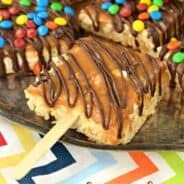 Thanks for linking up with Sweet Tooth Friday. Don’t forget to link back! 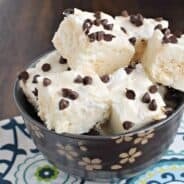 If I make these with regular sized marshmallows, how much would I use? Umm, so I super miss the days of eating an entire pan of Rice Krispies in one sitting, lol. Now, I’d have to start walking to work to balance that out and I live 20 miles from where I work. I’d still go for a “one sitting” eating on occasion though! I used to live by a Rocky Mountain Chocolate Factory and I forgot how much I loved these — can’t wait to try them! My cup of tea, exactly ! How many oz. of white choc. chips did you use for this recipe (what size bag)? I just love your blog!! I was wondering where the recipe is for the Rocky Mountain Chocolate Factory’s Avalanche Bark is.